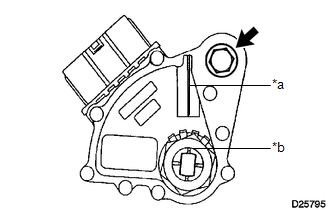 (a) While pushing the shift lock release button, move the shift lever to N.
(b) Remove the bolt of the park/neutral position switch. (c) Clean the bolt and bolt hole. (d) Apply adhesive to 2 or 3 threads on the end of the bolt. (e) Align the neutral basic line with the groove as shown in the illustration. (f) Hold the park/neutral position switch in position and install the bolt. (g) After the adjustment, perform the park/neutral position switch operation check (See page ).